Vintage Halo Diamond Engagement Ring with Pave Setting | Shane Co. 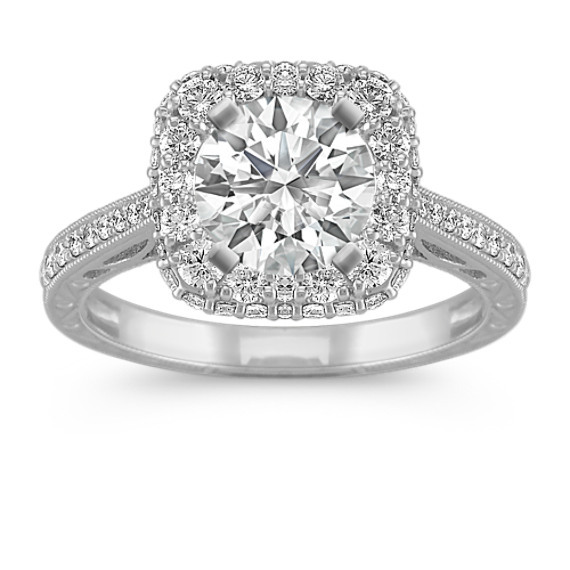 This glorious vintage inspired halo engagement ring is sure to catch her eye. Seventy round pavé-set diamonds, at approximately .59 carat total weight, provide the perfect accent to the center stone of her choice at approximately 1.00 carat. Hand-matched for color and clarity, these gems are crafted in quality 14 karat white gold with milgrain and engraved detailing. The total gem weight is approximately .59 carat. Soo I took my friend to shane co to show her my engagement ring that is on layaway and she stumble upon this setting and fell completely in love with it. The profile of the ring seriously looks like something a Disney Princess would have!! And she is all about the princess theme for her wedding.